Every knitter needs to learn how to knit basic rib stitches because they're the ones you will probably use the most. 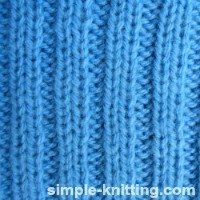 Knowing these basic rib knitting stitch patterns will help you when you start making all those cozy sweaters and socks. The reason is, that ribbing is one of the best ways to create a stretchy form fitting piece of fabric. The nice thing is ribbing is reversible. The list is endless. Whenever you need your knitting to snug up a bit add some ribbing to it to get the effect you want. For instance if you want a form-fitting top you can add some ribbing to the waistline. 1X1 rib stitch pattern and what that means is that you knit 1 stitch, purl 1 stitch all the way across your needle. This ribbing is stretchy and does look lovely on garments however it's not as stretchy as some other rib stitches. 2 X 2 ribbing and that means you knit 2 stitches, purl 2 stitches all the way across your needle. This ribbing is a really nice stretchy fabric even more than 1 X 1 ribbing and I use this when I want something extra stretchy. 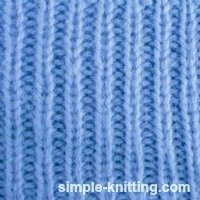 There are hundreds of ribbing stitch pattern variations you can try too. You just have to play a little and see which ones you like. For instance try ribbing these pattern variations - what do you think? Ribbing stitches are so versatile and you can be as creative as you like. If you want a ribbing stitch pattern that's really stretchy you may enjoy the 2 X 2 ribbing, even a 3 X 3 is super stretchy too. And if you're looking for a more decorative rib you might really enjoy something like the broken rib stitch pattern I have on my stitch patterns page. There are endless possibilities and they're all fun to knit. When you knit ribbing you knit the knit stitches and purl the purl stitches stacking them onto each other row by row. Remember: The knit stitch looks like little 'v's' and the purl stitches look like bumps. In the photo I have just begun ribbing so the little 'v's' aren't well defined yet but you can still see the little columns of knit stitches forming with the purl stitches in the background. For practice purposes and to make it easier for you, cast on an even number of stitches. I explain why a little further down the page. 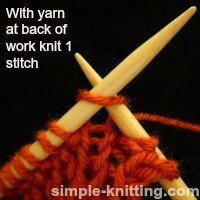 Make sure your yarn is at the back of your work and knit the first stitch. Note: See how I am knitting the little V or smooth stitch? Then bring your yarn to the front of your work and purl the next stitch. Note: See how I am purling into the bump? 2. Yarn in front to purl next stitch all the way across the stitches on your needle. When you finish your row, turn your work and start again. Continue with knit 1, purl 1. And that's how to knit rib stitches. 1. If you have an even number of stitches on your needle then every row is knit the same for ribbing - knit 1 and purl 1. So what if you have an odd number of stitches? Row 2: Purl 1, Knit 1 across row. 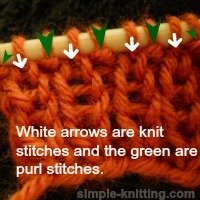 The knit stitch on the right side of your work is a 'v' but on the reverse side it is a bump (purl stitch). 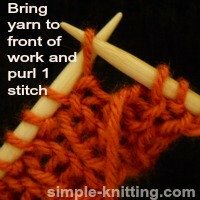 The purl stitch on the right side of your work is a bump but on the reverse side it is a 'v. With an odd number of stitches on your needle you will end your row with a knit stitch. When you turn your work to continue in ribbing your first stitch will be a purl stitch because it will have the bump so you'll begin the new row with a purl stitch. The thing is, you want to knit the 'V's' and purl the bumps throughout your ribbing. 2. Always remember to move your yarn back for knitting and forward for purling otherwise you will make little holes and add a lot of extra stitches. 3. The wider the ribbing is, the less elasticity it will have. 4. Many patterns especially for sweaters will ask you to knit the ribbing stitches on smaller needles. Why? Because it makes the fabric more snug. So for instance ribbing along the sleeve cuffs and the border of your sweater will probably be done on smaller needles, usually one or two sizes smaller. 5. If you are working a ribbing stitch pattern always try it out first on a test swatch to see if it will be stretchy enough for what you want. Some rib stitches are more elastic than others.